The Minnesota Timberwolves, Cleveland Cavaliers, and Philadelphia 76ers made a 3 way trade earlier this month. 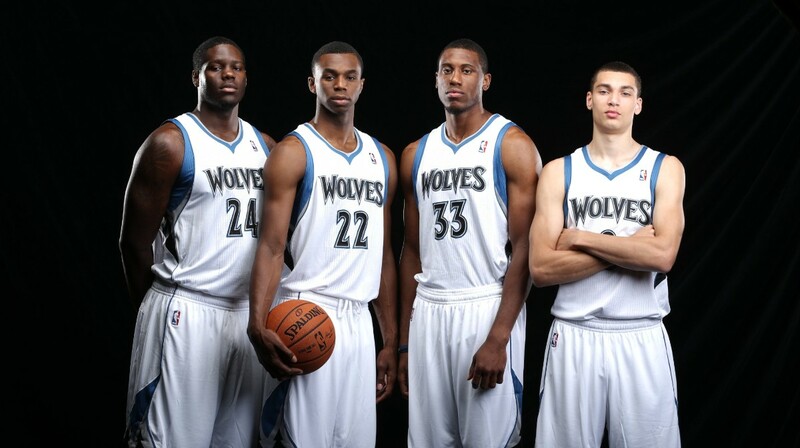 Minnesota received Anthony Bennett, Andrew Wiggins, Thaddeus Young and $6.3 Million. The 76ers received a 1st round pick, Luc Richard Mbah a Moute, and Alexey Shved. And of course, Cleveland landed Kevin Love. Kevin Love for the last six years has been the face of the T-Wolves franchise, but now joins up with LeBron James and Kyrie Irving in what the players are calling, “The Land.” Kevin Love has never played in a playoff game in his career and neither has Kyrie Irving. I can honestly say that I believe in LeBron and the Cavs starting five through the regular season to finish atop the Eastern Conference. When it comes to playoff time, will Kevin Love and the rest of the Cavaliers be ready? Due to lack of experience Im seeing a first round exit to possibly the Hawks, Knicks or the Nets. Each of those teams have playoff experience and aren’t projected to place at the top of the conference, but can compete with top teams. As for the 76ers, I don’t think they are close to being a top team yet, and they’ll probably finish in the cellar similar to last season. They have a very bright future with young blue chip prospects such as Nerlens Noel, Michael Carter-Williams, and their latest 1st rounder, Joel Embiid. The Sixers will probably have the opportunity to draft another top prospect and only then will they be ready for a possible playoff-birth in a year from now. Looking at this season though, it’s going to be a rough time for Sixers fans as they watch their team struggle through their schedule in a deep rebuild. Finally, the T-Wolves. With a completely new look, I already think that they’ll contend to reach the playoffs. It would mark the first time since the 2003-04 season that the Timberwolves were in the playoffs, when they lost to the Lakers in the Western Conference Finals. They likely should make the playoffs this season, led by the young guns of Andrew Wiggins, Thaddeus Young, Anthony Bennett, and Zach LaVine, in addition to Ricky Rubio. With a motivated and passionate fan base, the team is primed for a return to playing basketball in late April into May. I’m predicting that Andrew Wiggins will win rookie of the year and will be the leader of the team. Not once had they made it to the playoffs with Love, but with the core that they have now, the Timberwolves will be good for a long time in the NBA. They should start off the next few years in the middle of the pack with early playoff exits, but two seasons down the road they’ll be definite title contenders if they can keep their core players. I’d say that the Timberwolves were the real winners of this trade but it should be fun to see how it plays out!